You can add a cup of chopped spinach to increase the nutritional value. You can add a cup of cooked ground chicken or turkey sausage to increase the protein content. You can add ¼ cup of pine nuts to increase the nutritional and protein content. Cook the orzo according to the directions on the package. Dump the cooked orzo in a large strainer over your sink and rinse for 30 seconds with cold water. This will cool down the pasta and help it to seal, so it won’t absorb all of the liquids you will add. Drain well and pour the pasta into a very large bowl. Add the tomatoes, basil, olives, garlic salt and Feta cheese (along with any additional ingredients from my additions list). Mix well. Add in the liquid ingredients and mix well. Add salt and pepper to your own taste. 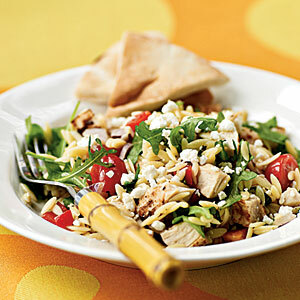 If the orzo salad is too dry, add a little extra olive juice or a dash of extra oil and vinegar dressings. Serve as a main dish or as a side dish. The orzo may be a bit dry the next day. To moisten it up, without adding extra calories, I add some of the juice from the Kalamata Olive jar. I am on twitter. I’m @deborahenos Thank for your note!